Tom Lyne, originally from Edmonton, Canada, moved to Europe after graduating from McGill University with distinction on jazz bass. His diverse roots range over many styles and genres as does his experience with many different instruments. Working predominantly in the Jazz world, Tom capitalises on the unique colours and ranges of the double bass and 5 string electric bass. Tom has been a member of the musician’s union since the age of 18 (Canada initially and UK now) and as a composer has an extensive catalogue of original compositions with SOCAN (Society of composers, Authors and Music Publishers of Canada 1988-2002) and more recently transferring to PRS & MCPS when it became clear the move to the UK was permanent. Tom also writes and arranges scores for Jazz Big Bands and ensembles, instrumental ensembles of mixed styles of all sizes, Choirs, vocal bands, traditional R&B, and string arrangements. Tom operates HillShed Multimedia from his Pathhead studio and has recorded and produced CDs for individual artists and arts organizations in addition to producing his own compositions for commercial media. Previous posts include audio engineering for Caber Music, Sound Cafe Studio, and producing vocal tracks for Guidance records of Chicago. During the 90’s in Holland, T4 Productions (now HillShed Multimedia) was set up to compose and produce soundtracks for promotional and educational videos, securing contracts with Ballast Nederland BV, Herman van Meekren, The City of Utrecht, LOKV (arts organisation), Lucas van Royen of Media Werk NL, and AT5 Television. This work also included the production of demo tapes and CDs for artists and enabled me to work in the emerging computer music, games and video industry. Trio with Tom Lyne & Chick Lyall a new trio project in the works with appearances at the Blue Lamp in Aberdeen, the Jazz Bar, Edinburgh Jazz & Blues Festival 2014. Sophie Bancroft is an influential improvising singer songwriter who has been working with Tom Lyne since 1998 and has played many festivals and concerts together http://bancroftlyne.com/. In November 2013 their Duo was selected in to be part of the 2014 Made in the UK Showcase and performed two concerts at the Xerox Rochester International Jazz Festival (June 2014). They also performed in New York City, and then the Tron Kirk at the Edinburgh Jazz and Blues Festival 2014. The most recent CD ‘You Turned the Tables on Me’ (2012) is their sixth release on LisaLeo Records since 1999. Amy Geddes band – A trio with Amy Geddes on fiddle, Kevin MacKenzie (guitar) and Tom Lyne (double bass). The shared intimacy of these players brings a new sound to the Scottish fiddle scene mixing traditional and contemporary compositions. Their CD ‘Messing’ was released in 2012 and the band continues to tour throughout Scotland playing gigs and festivals. The Corrina Hewat BandThe Corrina Hewat band includes, Tom Lyne and Dave Milligan as well as Fraser Fifield and Alyn Cosker. The Unusual Suspects The massed fiddles, bagpipes, accordions, whistles and vocals, audaciously orchestrated with harp, piano, a powerhouse rhythm squad and a blistering brass section, transforming Scottish traditional music into a grand-scale fanfare for the 21st century. Red Shift is one of the most exciting additions to the UK contemporary jazz music scene: an ensemble of improvising composers containing five trombones and rhythm section. Red Shift seeks to introduce the exciting sonic frequencies of the full trombones family. The group includes; Rick Taylor, John Kenny, Chris Greive, and Patrick Kenny on trombones. The rhythm section is; pianist Chick Lyall , bassist Tom Lyne and drummer Tom Bancroft. Amphibology – The latest electric jazz trio project involving Kevin Mackenzie on guitar and fellow Canadian Chris Wallace on drums. Formed in 2012, performances include Edinburgh House concerts and The Blue Lamp in Aberdeen. The Band Lyne. Since it’s inception in November 2005, it has become the vehicle for Tom Lyne to showcase his compositions, step forward as a soloist, and explore a refreshing and modern take on the electric improvising band. Joined by keyboardist Chick Lyall, accordionist Martin Green, and drummer Tom Bancroft, this quartet has struck up a unique sound and delivers an exciting concert. 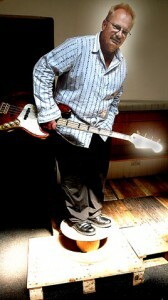 In addition to his regular groups, Tom Lyne has been working as a freelance bassist with Brian Kellock, Tommy Smith, Fionna Duncan, Martin Green (the Green Machine), Joakim Milder, John Rae, Tom and Phil Bancroft, Sandy Wright, Donald Hay, Ian Copeland, Rick Taylor, Kevin Mackenzie, Simon Thoumire, Catriona MacDonald and Alyth McCormack. More recently I have been working with Lianne carol, Simon Purcell and Julian Seigel. The Fionna Duncan Jazz Vocal Workshop. 5 years teaching music technology at Loretto school Musselburgh. Supply teaching of bass and double bass at Perth College, Stevenson College, and Napier University. The DBS summer school of voice. Core member of the Pathhead Music Collective, administrator, manager and educator. Whilst based in Amsterdam, Tom made numerous trips to Scotland to work with Tom, Phil, and Sophie Bancroft in various different bands; The Orange Ear Ensemble, The Phil Bancroft Octet, Trio AAB, Sophie Bancroft & Gina Rae, Kilt Couture. This work involved Assembly Direct tours around Scotland in addition to the Glasgow International Jazz Festival, the Edinburgh Fringe Festival, the Dunoon Jazz Festival and several BBC radio broadcasts. The work continued in Europe at the Banlieues Blues Festival, Paris, the Grenoble Jazz Festival and a tour of Hungary with Trio AAB. After travelling to Nice, France in 1991 to help establish the band ‘Men Without Heads’ with his song writing partner, saxophonist Calder Spanier, Tom played, toured, recorded, and wrote music, living in Nice, Paris, Zurich, and Amsterdam where he finally settled. In 1993 the band became ‘Granny Smith’ and recorded the CD ‘Red Door’. Elstar Management and Rennet Records stepped in to handle management, touring, promotion, and distribution of the Granny Smith CD. The band ended as the result of the tragic death of writing partner and band member Calder Spanier. At McGill University Tom was a performance bass major with Michel Donato (bassist with Oscar Peterson, Toots Thielman, Carmen McRae, Clark Terry) and also studied composition, theory and orchestration. It was during this period in Montreal he met and became involved with a great many musicians: Mike Rudd, PJ Perry, Calder Spanier, Tommy Banks, Martha Reeves and the Vandellas, Mike Allen, Gary Guthman, Ted Warren, Tom Bancroft, Charlie Hunter, Denzal Sinclaire.